Multinational Operations Training Centre is performing the activities related to the training and improvement of units for participation in multinational operations, which mostly include planning, organizing, coordination, control of capabilities and evaluation of SAF units. Multinational Operations Training Centre (MnOp TC) is stationed in the town of Bujanovac. 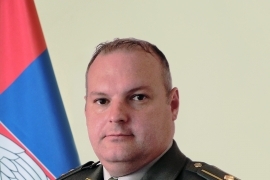 Lieutenant Colonel Branislav Stevanović is the Commander of the Multinational Operations Training Centre. Assistance and participation in the training of individuals and teams of the Serbian Armed Forces and partner nations for participation in multinational operations. Training in the Multinational Operations Training Centre is realized on the module principles, which are upgraded and mutually linked. There are four modules: (1) Academic training, (2) Training of staff, crews and sections, (3) Conduct of joint exercises, and (4) Conduct of firing individual and collective arms. The training is conducted in classrooms, on simulators and training equipment. Currently, the MnOp TC includes the Center for individual learning of English, but the delivery of the rest of the simulators and training equipment necessary for equipping the Simulation Center are also planned. The training is conducted in training fields, in closely realistic conditions. The units in training have the opportunity to conduct all the operative procedures in conducting tasks in multinational operations, such as: patrols, convoys, control points, reaction to incidents in the base, observation in the assigned zone, control of mass gatherings and riots, terrain search, aircraft marshalling, and medical evacuation of the wounded and the ill. Currently, there are two separate base camps and a permanent control point built at the training field. Traffic roads are built within the training field. “Rujan” training field, with its topographic characteristics, provides a large maneuver space for units in training. Depending on the scenario of the exercise, at “Rujan” training field, exercises for units up to and including at brigade level can be realized. firing portable anti-tank rocket launchers. Peacekeeping Operations Training Centre was established on May 20, 2012. The uniqueness of the Centre is clearly seen in the fact that this is the first unit of the Serbian Armed Forces responsible for training of the units to be deployed in multinational operations. The units of the SAF to be deployed in multinational operations in Lebanon and Cyprus are conducting their training in the Centre at the moment.